BYU-Pathway Worldwide experienced tremendous growth in its reach and impact in 2018. We are working diligently to build a school in Zion and for Zion by expanding access to education for students throughout the world, strengthening students spiritually, and increasing employability. 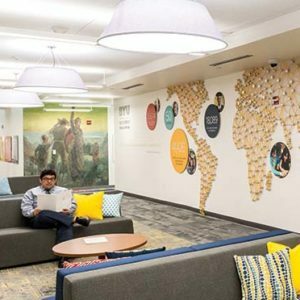 BYU-Pathway is also quickly becoming a model of education for a new type of student across an increasingly worldwide Church. We are focused on serving first-generation and non-traditional students — a demographic that makes up over half of the Church. In fact, nearly 70 percent of our students choose between BYU-Pathway or no higher education at all. 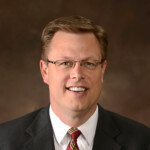 Similar to the time of the Nephites, there is great inequality for learning opportunities in the world today — even in the U.S., only 11 percent of students whose parents are in the bottom income quartile will complete a bachelor’s degree.2 Many Church members are faced with the obstacle of finding meaningful work and income without the means to earn an education. 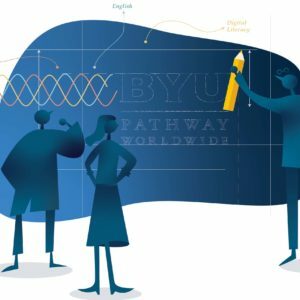 BYU-Pathway is creating unique opportunities tailored specifically to their needs. In this sense, BYU-Pathway is reaching toward Zion, as described in Doctrine and Covenants 82:17-19, by helping every member improve their talents through increased access to education. To help our students press on despite their difficulties, we have implemented monthly devotionals to increase students’ faith, motivate them to live the gospel, and help them persist toward their goals. We are also piloting a mentoring program that led to retaining 1,200 students so far. Additionally, we are redesigning the PathwayConnect curriculum, which will better prepare students for further education and future employment. The new curriculum will help students develop life skills, professional skills, and university skills, and seamlessly transition them between PathwayConnect and online certificate and degree programs. In order to strengthen the employability of our students, significant work has also gone into creating a new online certificate and degree structure, which will take effect this spring. Each program has been thoroughly evaluated to be uniform across the board, stackable, and highly employable. As a result, 13 new job-ready certificates (for a total of 28 certificates) have been created, which will feed into more focused and marketable associate and bachelor’s degrees. This is indeed a “monumental moment,” not only for BYU-Pathway Worldwide, but for Church education. All of us feel privileged to be a part of it. Elder Kim B. Clark said, “It is a miracle that we can say today that BYU-Pathway is a school in Zion, wherever Zion is.”4 I am grateful that the Lord has directed a school to be established in Zion to bless His children as they build His kingdom and prepare for His Son’s Second Coming. I thank everyone contributing to this great effort in BYU-Pathway. Comment on "A School in Zion"
Thank you president Gilbert for the inspiration and encouraging words.Your message has reminded me of the counsel from a prophet in the Book of Mormon, Moroni 10: 2-3″ And I ” seal up” these records, after I have spoken a few words by way of exhortation unto you. Behold, I would exhort you that when you shall read these things, if it be wisdom in God that ye should read them, that you would remember how merciful the Lord hath been unto the children of men, from the creation of Adam even down until the time that ye shall receive these things, and ponder it in your hearts.” I am among those. students who felt the Lord’s tender mercies. The Pathway Program has changed my life in a way I had never expected before. The words alone can’t express my appreciations but through the Holly Ghost, people may know how I feel. My faith in the Lord has been strengthened and the ability to serve others increased. I had missed the opportunities to further up my education but the Lord Has come to my rescue. I am glad to be a student in this Pathway Worldwide Program. I have become a leading example in my family and those around me, hopefully they will follow the same foot steps. I know that it is the Lord’s program and He want all His children to learn and gain the knowledge He has. Education is a commandment from God and He want us to help built Zion . He gave us a prophet Russell M. Nelson to lead us and his counselors and Apostles are called of God. The Book of Mormon is the word of God and the ordinances we perform in the temples are true. All our church leaders are called of God. I know that God loves all His children. I pray for your words of inspiration president Gilbert in the name of Jesus Christ: Amen.